Would You Put Your Fertility Treatments on Kickstarter? It used to be that asking your friends, or even strangers, to give you money was considered gauche. Sure, they might donate to your political campaign, or they might pledge some money toward the charity of your choice in exchange for you running a marathon. But you'd never ask them to help pay for your rainbow-themed birthday party. Well, times have changed, as they have a way of doing, and these days we've take to asking people to give us money to fund our artistic endeavors, our fledgling businesses, and just about everything else. So, why not our IVF treatments? Oh, hmm, I bet you can think of a few good reasons if you really put your mind to it. KJ Dell'Antonia wrote about this extremely touchy topic for the New York Times, and one of the people she spoke to is Kimberly Sparkman. She is seeking funding for her IVF treatments on Indiegogo.com, one of the many crowd funding sites. Sparkman, who already has one child with her husband, can no longer conceive naturally and says that IVF is her last chance to have another baby. She's asking for $5,000 to help pay for her treatment, which is not covered by her insurance, and so far she's raised $1,000. She says she knew this was a good way to allow her friends and family to donate if they wanted; though she says it was hard to ask for the help and to tell her story publicly. The financial help of the hive mind has more commonly been sought to help with fund adoptions. In theory the goal is the same: for a couple to have a child. But in practice donating to the two different causes feels a bit different. In the case of adoption, it feels like a more clear cut case of helping someone in need, in this case a child who wouldn't otherwise have a family; whereas with IVF, you're helping to potentially create a new life where otherwise there would be none. For most of us (devout Catholics aside), it doesn't have anything to do with the actual procedure, since undergoing IVF has become a very common practice. It's more that being asked to fund someone else's fertility treatment feels a little bit, well, annoying—like being asked to give money instead of gifts at a wedding. I think it's because IVF seems so entirely optional and personal. While chipping in to someone's adoption can be seen as an altruistic act, paying for a friend's IVF seems closer on the spectrum to being asked to help pay for a chin implant to help make their dream of not hating their face a reality. It goes against ever fiber in me to not be able to carry my husbands child. to know that our chances are so minuscule without intervention is unbearable at times. After all, there are a lot of things in life that are far more unbearable. 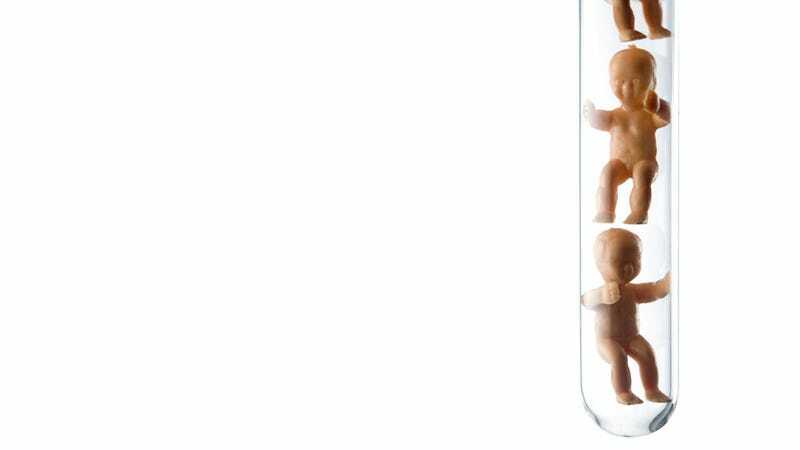 If what you really want is a child, should it matter whose DNA it has? Not to mention the fact that IVF often does not work, so you could be asking your friends to fork over thousands of dollars that basically gets thrown down the drain. But while it's easy for us to judge, is it really any of our business? Not exactly, because with the exception of people who talk to the New York Times about it, most people are doing this within their group of personal acquaintances—making pleas via Facebook and the like. And, according to those who do this, most of the money seems to come from people they know, not strangers. So if the only way a couple can feel fulfilled is to give birth to a baby, then why shouldn't they ask their friends and family for help? And if the easiest way to do it is by putting it online, then they're smart to do it that way, right? People are free to do whatever they damn well please with their money, and you're free to ask for it. If they don't support your cause, they won't give you the cash. Here's the thing, though: each individual request for IVF funding doesn't do much harm—even if it does seem tacky to the etiquette buffs out there. But as this becomes a growing trend, as crowdsourcing money for all kinds of things has, it does have the potential to have a wider impact. For instance, if you look at what's happened on Kickstarter, as it has evolved, people have had to become better at pitching their story and creating interest to stand out among the crowd. Will this happen with fertility funding? At some point in the near future, will getting money for IVF come down to who's best at marketing their suffering? That seems a bit unfair and perverse. Since what does making a charming video about how much you want a baby have to do with actually being good at, you know, raising a baby? Not that there's even any way to stop the practice of public IVF or adoption funding if we wanted to, but it is worth thinking about the larger consequences that are possible and where it ends. Will we soon be bombarded with Facebook requests from our 20-something friends who want money to help pay to freeze their eggs in case Mr. Right doesn't come along until they're 35? God, if you thought buying wedding presents for all your friends who are getting married was expensive, just wait until you have to start donating to their quests to start families or risk being judged as stingy by your circle of friends. But here's a question: if we pay to help create a baby via IVF do we then somehow have a stake in its future—as though we invested in a tiny, squeezably cute company? Do we get a cut of its future earnings to tide us through retirement? And on the flipside, will we someday receive an invitation to donate to its college fund? We'll probably just have to wonder these bizarre questions aloud to ourselves, since one thing is for sure: asking prospective parents for a cut of their unborn child's future salary is still very rude. Image via Monkey Business Images/Shutterstock.